Just how important is our waste transfer station to our fully integrated AWC process? Very, to put it simply. In fact, you could call it the cheese on the whole enchilada. The mayo on the BLT. 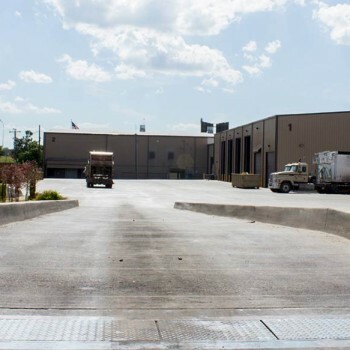 It’s where we unload waste onto our tipping floor to either recover recyclables via our Mr. Murph Recycling or load it into transfer trailers for transport to our one of a kind, waste to energy landfill, American Environmental Landfill. Once it’s at AEL, then we’re able to use it to generate enough electricity to power over 4800 homes across Green Country. So, you see, this is ground zero for where it all takes place. Come in for a visit and you’ll have first hand knowledge of what makes our transfer station stand head and shoulders above the rest. We’re conveniently located at 1150 North Peoria in Tulsa—that’s so we can save on travel time between your site and ours, plus achieve a lower carbon footprint for both of us. All are welcome to use our in city dump. That includes commercial waste haulers, independent operators, Tulsa dumpster companies, and the general public. We’re good at helping each customer on the spot and have the friendliest employees you’ll ever find. We’re also designed for easy access and outfitted with the latest equipment and technology…all to serve you better. If you’ve never tried us before, you need to stop in. Nobody cares about Tulsa’s environment more than we do. And, nobody does waste or recycling better than Tulsa Indoor Dump – Tulsa Recycle and Transfer.